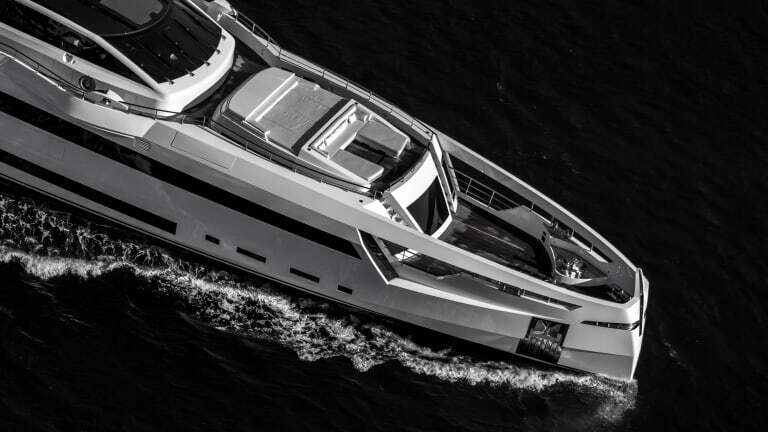 An owner in his 30s wanted a yacht that was fast and furious with dynamic design and a flexible layout. Rossinavi delivered. 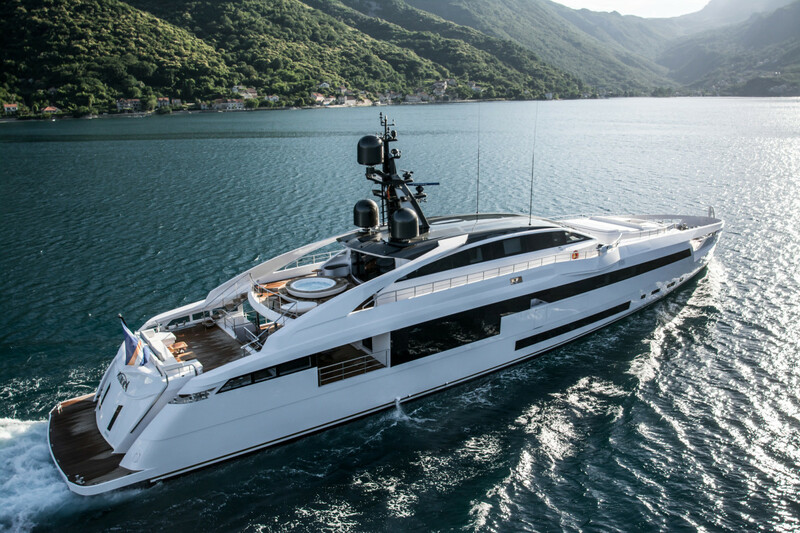 The European owner of the 161-foot (49-meter) Aurora is Rossinavi’s youngest client to date. 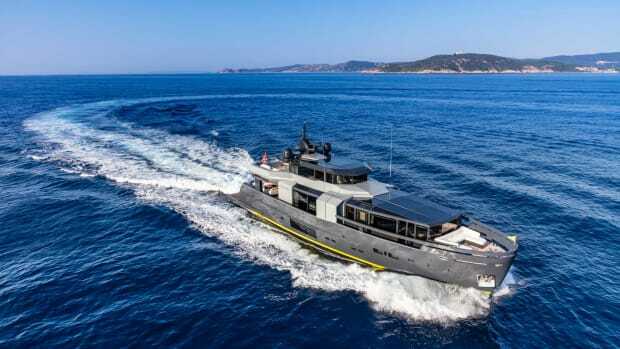 In his mid-30s, he wanted a yacht that represented his millennial mind-set: fast and furious with dynamic design and a flexible layout. Rossinavi was well equipped to deal with his expectations, having commissioned the International University of Monaco to research millennial habits and tastes. 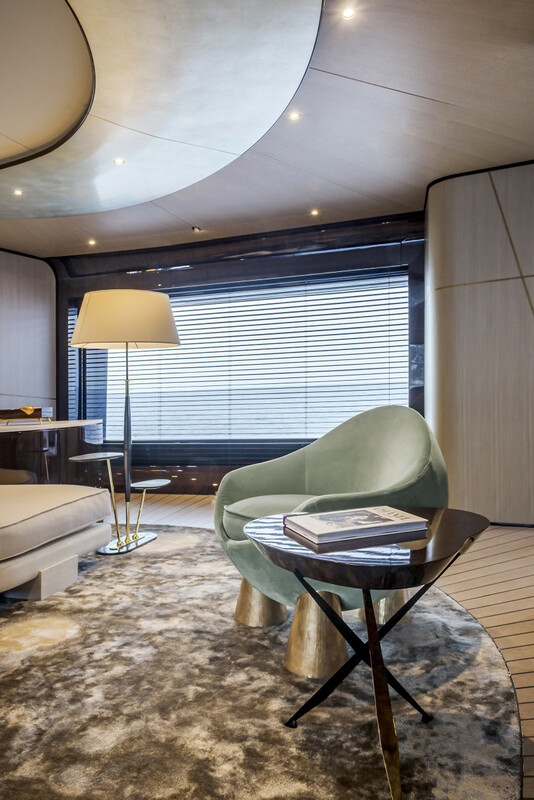 Aurora’s owner admired the 158-foot [48.3-meter] Polaris, which Rossinavi launched in 2014, and tasked the Italian builder with developing a design that stepped up the aesthetics and performance while remaining below the 500-gross-ton threshold. 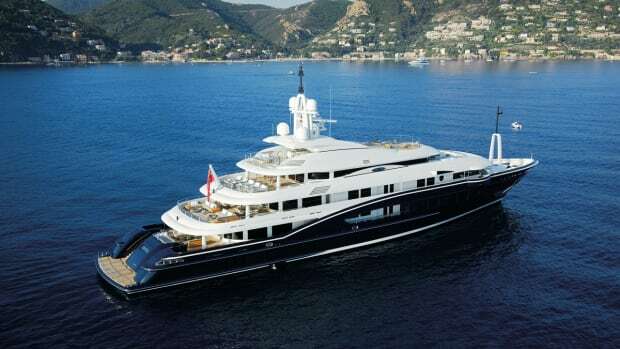 Topping his wish list were an outsized beach lounge and six large staterooms, three of them on the main deck. 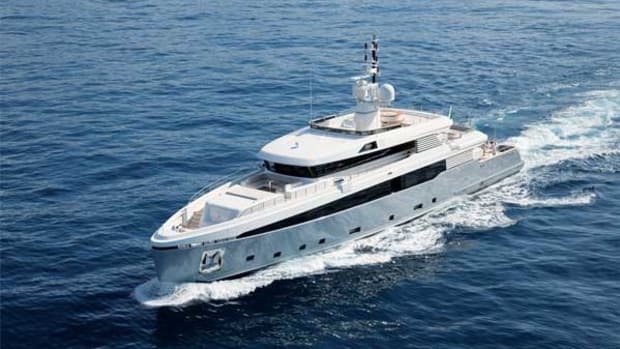 The layout is designed to maximize use of the large superstructure windows, and to give the owner options in different sea conditions. The answer was an unusual stepped layout. The beach club has space for a sauna and a 120-inch LED screen, and atop the beach club is a lounging area. The cockpit on the aft deck is on a lower level for alfresco dining, open-sided with shade from the deck above. The raised beach club protects diners from prying eyes when Aurora is moored stern-to in the marina. Another solution is hidden in the bow. Gym equipment is usually housed fully inside or outside, but Aurora blurs the boundaries with a hydraulic platform whose running and spinning machines can be raised. Bulwark cutouts and stylish architraves ensure structural rigidity while creating an open-air workout area that is pleasantly private, without increasing interior volume. 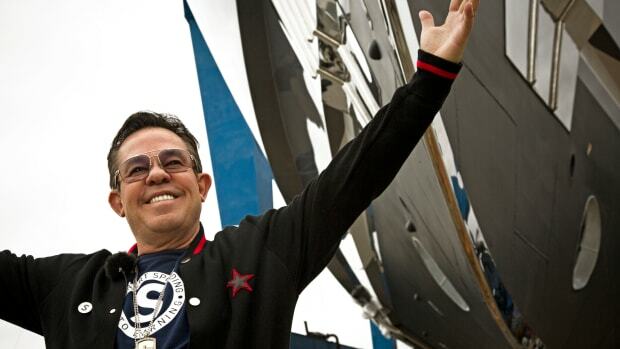 Initial 3-D modeling predicted that the yacht, originally sold as a 154-footer (47-meter), would be 476 gross tons. To optimize the remaining volume at just under 500 gross tons, Rossinavi lengthened the design by more than 6 feet (1.8 meters). 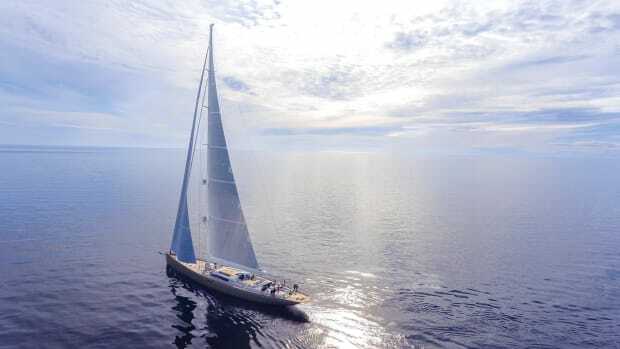 The aluminum hull form by Arrabito Naval Architects is a new fast-displacement design intended to combine the comfort of a conventional displacement hull at low speed with a top speed of 21 knots. 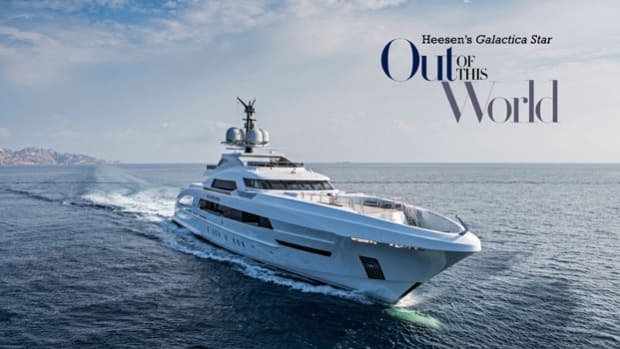 With a plumb bow for longer waterline length, the hull is 7 percent to 8 percent more efficient at cruising speed than similar yachts, with a corresponding reduction in fuel consumption, Rossinavi says. 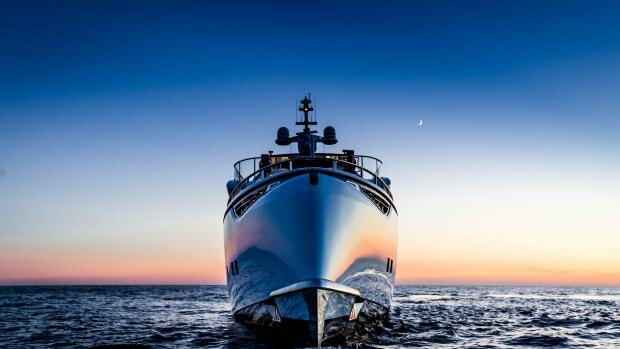 Fulvio De Simoni designed Aurora’s powerful exterior for an owner in his mid-30s. The exterior profile reveals the recessed open cockpit forward of the raised beach club. A highlight for Rossi is the engine room, where he persuaded the owner to paint the sole plating Ferrari red. 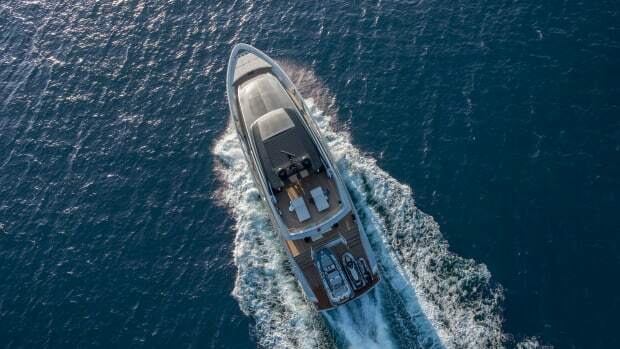 Visible equipment is neatly arranged with easy access for maintenance, with the yacht’s nine fuel tanks hidden to help manage weight distribution and trim. Designer Fulvio De Simoni developed the exterior styling in line with Aurora’s racy performance. The result is a cross between a greyhound and a bullmastiff: long, lean lines with aggressive accents; her domed bridge deck is like a sports car’s top; and her plumb bow has a muscular reverse sheer, with stainless steel details and hawseholes inspired by Iron Man’s mask in Marvel Comics films. 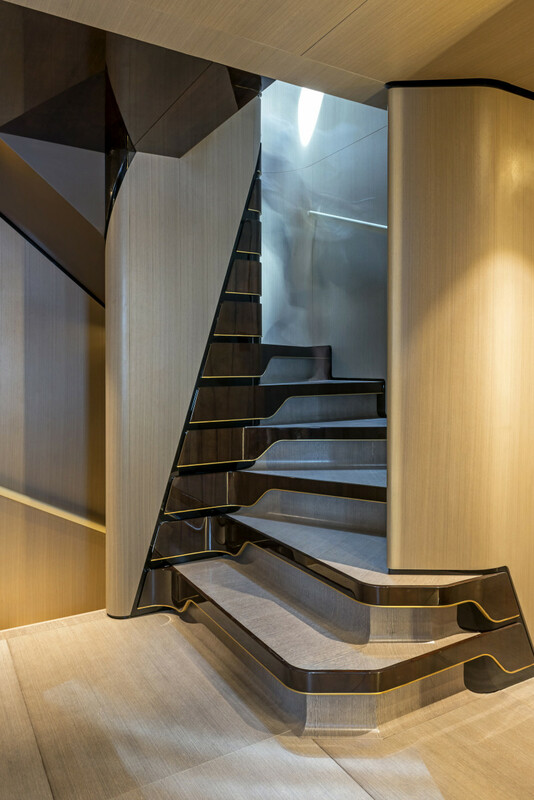 The main staircase comprises all three wood varieties on board: brushed teak, limed sycamore and glossy tineo. The interior design by Achille Salvagni provides a more feminine and delicate counterpoint. 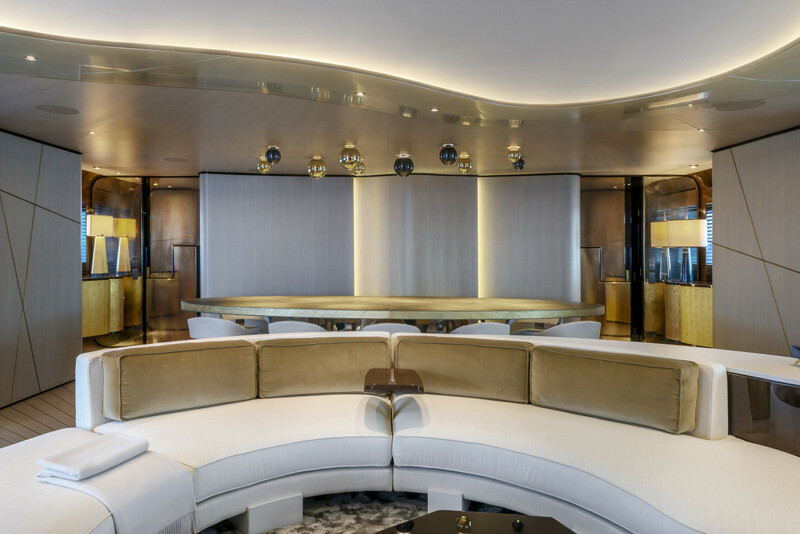 In his third collaboration with Rossinavi, the Rome-based architect integrates the complex yet calming signature style of his high-end residential work into a superyacht context by embracing creative solutions and avoiding overstatement. The bespoke furniture by Achille Salvagni and artwork draw on the Golden Age of Design, with soft curves and sophisticated finishes. Materials include velvety brushed teak, limed sycamore and glossy tineo, a South American wood with a golden sapwood that darkens after curing to a more subtle tone than ebony or wengé. (Steinway has used tineo to make the cases of grand pianos). Cabinet doors have a delicate hammered finish, while the dining table in the salon is scarified laurel wood with layers of gold leaf that add luster to the dappled burl. The dining table in the main salon was created using shimmering gold leaf on a laurel wood base. Salvagni was seeking to revisit the elegant sophistication of the 1920s and ’30s in a contemporary vein, reflected in his penchant for soft curves and ovoid shapes. In fact, none of the fitted or bespoke loose furniture has a straight line, overhead moldings are gently rounded, and paneled bulkheads have a curtain-like wave. “I’m looking to revive the Golden Age of Design when it was still aimed at the individual, before the advent of industrialized mass production,” says the designer. Elsewhere, he borrowed details from aeronautical design with exposed “rivets” and bronzed door handles shaped like airplane wings. 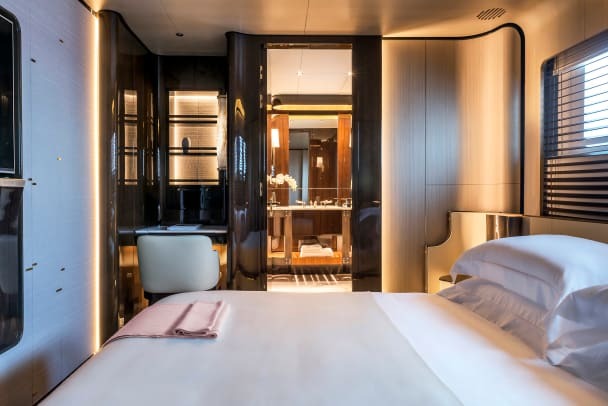 Paper-silk wallpaper is in the guest staterooms, main foyer and cabinet bases, and bathrooms are lined with gray-veined Carrara marble. A computer-controlled, 500-bottle wine store is the centerpiece in the main deck foyer. Of the six staterooms, only two are on the lower deck. 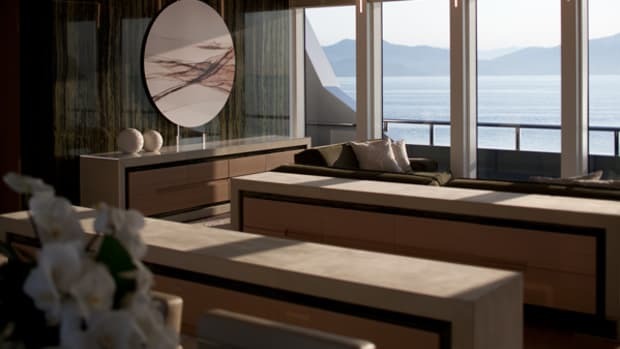 Two VIPs and the master (with forward-facing windows) are on the main deck, and a second owner’s stateroom is on the upper deck, overlooking an aft terrace and spa tub. 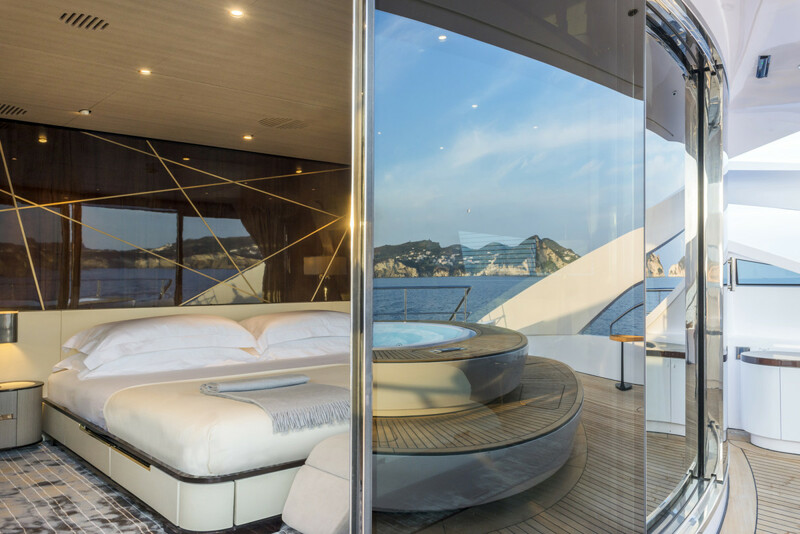 The layout is designed to maximize use of the large superstructure windows, and to give the owner options in different sea conditions. The main deck lobby is a focal point that serves as a backdrop to a glass-fronted wine store. 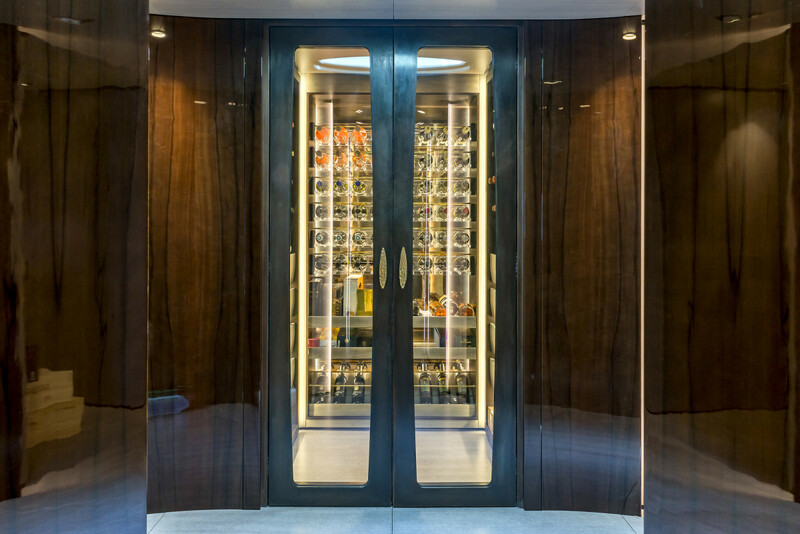 With space for 500 temperature-controlled bottles, it is equipped with password protection for the exclusive use of the owner—clearly a connoisseur of impeccable taste and unquestionable priorities.